from the Pat Hathaway photo collection. Cannery Row The History of Old Ocean View Avenue. Cannery Row from the 1960's to today. This image may be the most-seen image of Cannery Row. It was taken by photographer George Seideneck of Carmel. It was taken from a vantage point between Hoffman and McLellan Streets in Monterey looking northwest towards the Carmel Canning Co., Custom House Packing Corp. and Monterey Canning Co. It shows the California Packing Corporation plant 101 from in front of plant 106 that Ed Ricketts worked at part-time as a chemist, from 1943 until his death in 1948. The cart-wielding cannery worker is Henry "Hank" Damewood. 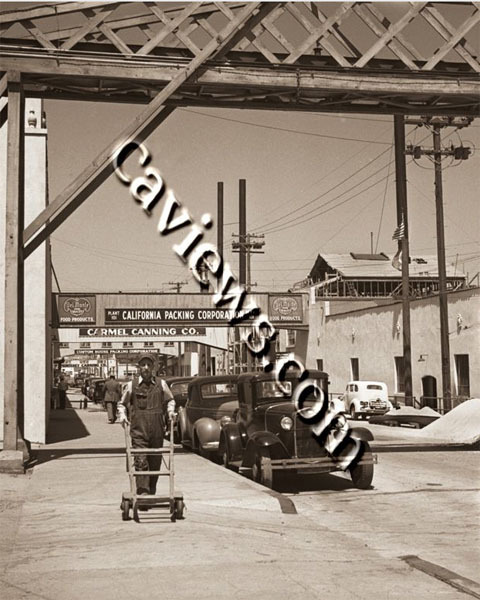 We have photos of most of the Canneries from F. E. Booth, Carmel Canning Co., Del Vista Co., Pacific Fish, San Xavier Fish Packing Co., Peninsula Packing Co., San Carlos, Aeneas Sardine Packing Co., Oxnard Canning Co., Hovden Food Products Corp. Fishing boats with names like, A. A. Ferrante, Adventure, American Eagle, City of Monterey. C.R. Martinolich, E.S. Lucido, Geraldine-Ann, U.S. Liberator, Lucky Boy, Mineo Bros, New Hope, New Marettimo, Star of Monterey, Pacific Star, Providenza, El Cerrito, Western Flyer, Western Maid, and Vitina A at one time fished in Monterey Bay. We also have photos of the California Abalone Industry and the Japanese Abalone fishermen We have photos from the early feluccas, Lampara , half-ring and photos of other purse seiners from the Monterey fishing fleet. We also have a number of photos of the fire that happend on Cannery Row. Cannery Row was made famous by John Steinbeck by the publication of his book of the same name. Cannery Row in 1945. Originally named Ocean View Avenue, it was renamed Cannery Row by the city of Monterey in 1958. We also have aerials photos of Cannery Row and the Sardine fishing industries and Fisherman's Wharf. 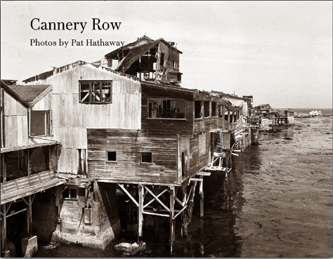 California Views has over 1,000 cataloged photos of Cannery Row, and even more of the Monterey's early Sardine fishing fleet on which the canning and reduction industries relied for their supply of fish. Photos of Monterey County listed in our database. 444	San Xavier Fish Packing Co.
652	Ocean View Hotel Wu M. C.
756 Sun Harbor Packing Co.
818 Monterey Fish Products Co.
filmed in the late 1960's this documentary evokes a felling of the by gone day of Cannery Row. In the early 1990's Harry Reasoner aired parts of it on CBS T.V. 60 minutes. Photo price list from 11x14" - 48x96"